Today, Gregory Davis, Collin County’s First Assistant District Attorney filed a "State’s Disclosure of Evidence Favorable to the Defendant." This is commonly known as a "Brady Material." Brady material, in short, refers evidence favorable to the defense that is known by the State. The State is required to turn this evidence over. Brady material is often the source of heated debates including what is, and is not, Brady material. Brady material requirements stem from the US Supreme Court case of Brady v. Maryland. Today’s filing goes on to detail some specifics regarding the State’s High-Five program. I previously reported on this program and detailed the shocking similarities to behavior alleged in the District Clerk’s case. This stemmed from the District Attorney requesting a new way to code this time off which was denied by the County Commissioners. Attorney’s Office were awarded paid leave in the form of"High Five" leave since January 1, 2003. The Criminal District Attorney awarded the leave in amounts ranging from one to eight hours. The supporting documents show that the paid leave time was awarded for meritorious conduct. The undersigned has found no evidence that any paid leave time was awarded for electioneering or political activity. 2. 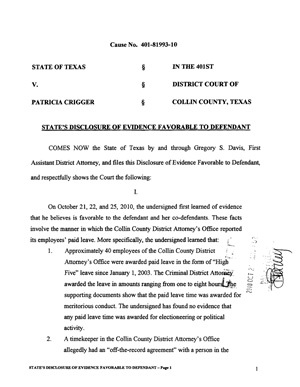 A timekeeper in the Collin County District Attorney’s Office allegedly had an "off-the-record agreement" with a person in the Collin County Human Resources Department to alter employees’ time records. 3. At least two timekeepers in the Collin County District Attorney’s Office altered employees’ time records to reflect that employees were at work when they were actually on "High Five" leave. 4. A timekeeper in the Collin County District Attorney’s Office believes that "everyone" in the county was altering employees’ time records, including persons in the Collin County Human Resources Department. 5. Per a department spokesperson, the Collin County Human Resources Department had no knowledge of the "High Five" leave program prior to June 2,2010. 6. Per a department spokesperson, the Collin County Human Resources Department instructed all timekeepers to accurately report county employees’ times. 7. An undetermined number of scheduling requests for investigators in the Collin County District Attorney’s Office were destroyed without the knowledge of the Criminal District Attorney or the undersigned. Mr. Davis further states, "While the undersigned believes that much of this newly discovered evidence will be held to be inadmissible at trial, he believes disclosure of this evidence should be made to ensure full compliance with Brady v. Maryland." This certainly seems to lend credibility to my previous article of the similarities in the High-Five program and what the District Clerks were doing. So this begs the heated question, "What is the question?" What must the state prove? Not just the behavior, but that behavior must actually be a crime. Mr. Davis’ filing seems to suggest the reason for the time off is what is in question. (I think if this question was posed months ago, that wouldn’t be the issue). It would seem that the State planning on arguing it IS ok for an elected official to give time off on their own made up program. It IS ALSO OK to lie about that to human resources and say those workers were there when they were not. But apparently it is a Felony if during their time off they decide to campaign. The filing seems to make this distinction by the line, ""[t]he undersigned has found no evidence that any paid leave time was awarded for electioneering or political activity."